Volcanoes Safaris, our in-country partner in Uganda and Rwanda recently added a new eco lodge to the Volcanoes Collection. The new lodge, Kyambura Gorge Lodge, is located in western Uganda on the border of the Kyambura Gorge and Queen Elizabeth National Park offering incredible views with the peaks of Rwenzori Mountains in the background. The lodge was carefully constructed to ensure practical ecotourism initiatives were in place and that the lodge could help further conservation efforts and work with the local communities. Kyambura Gorge Lodge participates in a wide array of community projects that educate the local people. Projects emphasize wildlife preservation, increased tourism income for the communities, and community development. Some initiatives in place are creating football, netball and fitness classes for local children, working with women’s groups to produce organic coffee and a vegetable garden, restoring a wetland, and creating a buffer zone along the gorge to protect the 20 endangered chimpanzees living on the gorge. Kyambura Gorge Lodge differentiates itself from other accommodations by playing a pivotal role in the community and expanding ecotourism initiatives to protect the area. The lodge has created a 150 acre mini wildlife reserve which protects the chimpanzees, preserves a wetland, and minimizes human wildlife conflict. The community activities available at Kyambura Gorge Lodge were created by the Volcanoes Safaris Partnership Trust (VSPT). The VSPT links the lodge to neighboring communities through a variety of projects that promote the conservation of chimpanzees and the environment. Guests can take a guided community tour to the Volcanoes Safaris Partnership Trust sponsored coffee processing station or the wetland restoration project. The project also helps train community members to be guides in wildlife and conservation. The main building of Kyambura Gorge Lodge was originally a coffee store and processing plant. 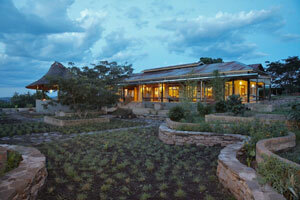 Recycled materials were used to construct much of the lodge. There are 4 spacious bandas (Ugandan style thatched huts) situated on the hillside. 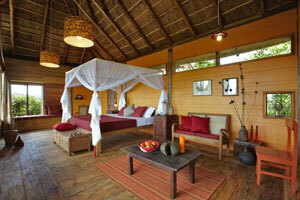 Each banda is different and has a covered entrance deck, bedroom, balcony and its own luxury bathroom. The bandas were built using different building and roofing materials that help ensure they blend in with the surrounding landscape. Each banda has a unique color scheme and all are elevated off the ground to allow for better ventilation and the best views of the gorge. Four more bandas are being constructed that will be available in early 2012. Kyambura Gorge Lodge offers many eco tours and wildlife activities, including birding and hiking, as well as unique cultural community activities. The Mweya Peninsula has a wide variety of animals and the Kasenyi track located near Lake George in the northern side of the park is renowned for its lions. Wildlife at the Queen Elizabeth Park includes 6 monkey species, 2 of Africa’s big cats, the lion and the leopard, hyenas, small carnivorous cats, mongooses, elephants, hippos, and water buffalos. The lodge can also arrange an overnight excursion to see tree-climbing lions in Ishasha in the south of Queen Elizabeth Park. Additionally, there are around 600 bird species in the nearby areas, the highest number of bird species in any one area of Africa. The crater lakes are home to beautiful flocks of pink flamingos. 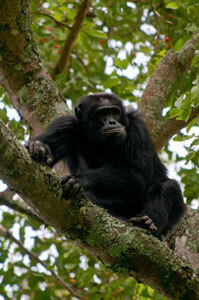 Kyambura Gorge is one of the best places to see chimps in Uganda. Tracking is available all year. The walk typically lasts about 2-3 hours during which you will hear the sounds of hippos, eagles, and other wildlife of the gorge. Chimpanzee tracking is also available in Kalinzu, a forest reserve about 30 minutes away, and in the forest of Kilabe, about 2 hours away. Cultural activities offered by Kyambura Gorge Lodge include a visit to the Katwe salt lake where visitors can observe salt being extracted the same way it has been done for centuries. Fishing villages are also a great place to interact with locals and see how they co-exist with the park’s wildlife. Kyambura Gorge Lodge is 45 minutes from Kampala by private plane, landing at either Kasese or Mweya. Should you wish to drive the lodge is about 6 hours from Kampala via Mbara or Fort Portal.